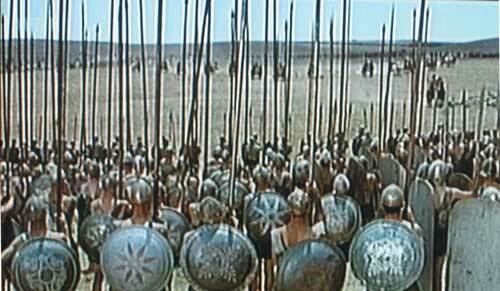 The sarissa was a gigantic 16-20 foot (6 m) long double pointed pike used in the Macedonian phalanx. Its great length was an asset against hoplites and other soldiers bearing smaller weapons, because they had to get past the sarissa to engage the phalangites. The tight formation of the phalanx created a "wall of pikes", and the pike was sufficiently long that there were fully five rows of pikes in front of the front rank of men—even if an enemy got past the first row, there were still four more to stop him. The Macedonian phalanx was considered all but invulnerable from the front, except against another such phalanx; the only way it was ever generally defeated was by breaking its formation or outflanking it. The invention of the sarissa is credited to Philip, father of the celebrated Macedonian king, Alexander the Great. Philip drilled his hitherto demoralized men to use these formidable pikes with two hands. The new tactic was unstoppable, and by the end of Philip's reign the previously fragile Macedonian kingdom controlled the whole of Greece, Epirus and Thrace. His son Alexander used the new tactic across Asia, conquering Egypt, Persia and the Pauravas (northwest India), victorious all the way. The sarissa-wielding phalanxes were vital in every battle, including the pivotal battle of Gaugamela where the Persian king's brutal scythe chariots were utterly destroyed by the phalanx. The sarissa remained the backbone for every Hellenistic army until the rise of Rome.